There are many different colors, styles, and lengths to choose from. This guide will help you see what is available for your pairs of chucks. Click on the yes links to order that color/type/length of shoelace. Shoelace styles include our classic flat athletic shoelaces for chucks, which are available in twenty-seven different regular or neon colors, wide (fat) or extra wide shoelaces in twenty-one colors, narrow round shoelaces in nine colors, rainbow and red white and blue multi-weave laces, retro shoelaces in ten colors, special print shoelaces with star, red white and blue, camouflage, skull, tribal band, and checkered patterns, and two color reversible laces in six color combinations. * This is a discontinued color/model. After the remaining inventory is sold, the color cannot be re-ordered. 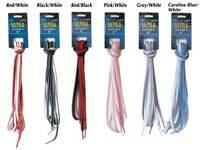 ** Many of the fat (wide) laces come in a relaxed fat width, which is closer to 9/16" wide. *** Light grey flat athletic laces are only available in the flat ribbed model. This color is also known as silver.